There are so many little things that can divert our attention from the bigger, more important issues of life. Slow service at a fast food restaurant. Listening to criticism that is unjustified from someone who’s uninformed. Wait in line at the grocery store. Doing most of the work without anyone helping. 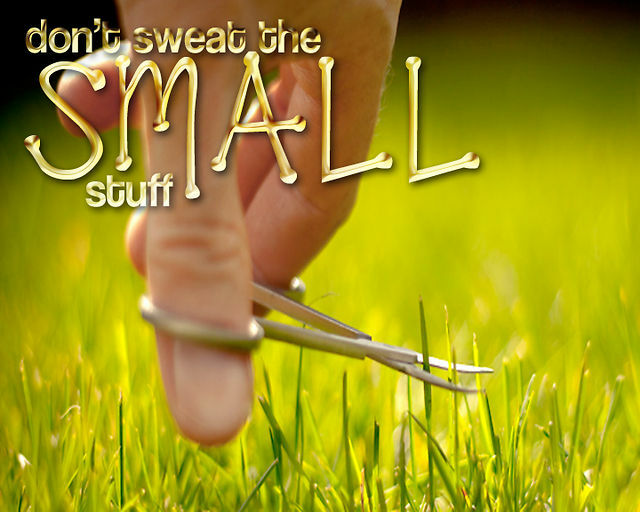 What do you do about the small irritants? Complain to Jesus? I know someone who did. Luke records an occasion where Jesus journeyed to Bethany to visit two sisters. Mary and Martha. (Lk. 10:38-42). Their brother was Lazarus, whom Jesus later raised from the dead. Apparently, Jesus had a close connection and felt a special affinity for this family. Martha welcomed Jesus into her home and began preparations for a meal. This would have been a considerable task. Usually, Jesus traveled with some or all of the apostles. If he did on this occasion, it would have been a lot of work to prepare a meal for so many people. Remember, too, this is before the days of modern conveniences. No casseroles already prepared and in the freezer. No restaurants to deliver food. No microwave ovens. Martha was busy. The Bible says she was “distracted with much serving.” There was a lot on her plate. Because she was doing all the work by herself. Where was her sister, Mary? Sitting at the feet of Jesus listening to His Word. Martha had enough. She was irritated, anxious and upset. So, she complained to Jesus. “Don’t you care that my sister has left me to do the work by myself? Tell her to help me! Think about Martha’s complaint. She has the audacity to accuse Jesus of not caring. And she tells Jesus what he ought to do–make my sister help me! No doubt Martha was expecting Jesus to rebuke Mary and propel her into action. Ironically, Martha is the one who received a mild reproof. Jesus was not only telling her not to sweat the small stuff but to refocus her priorities on something of infinitely more value. Now before, we’re too hard on Martha. She was a good person. A hard worker. A ministry minded woman. She loved Jesus. But, she was distracted. She allowed the ‘small stuff” to aggravate her. There are many lessons from this text. But for today don’t let yourself get overwrought with the mundane issues of life. Sure, there are bills to pay. Appointments to keep. A house to manage. A car to service. People who need our attention. Notes to be written. Events to attend. Vacations to plan for. And retirement to plan for. Add to all of these personal responsibilities, the concern of our community, national and international problems. We worry about our safety. The economy. World peace. Who’s in the White House. And what life is going to be like for our children and grandchildren. Whoa! Slow down. Relax. Take a deep breath. Refocus your thinking. Practice patience. Live in the moment. Accept the imperfection of others. Manage your stress. Lighten up. Mind your own business. And remember Jesus’ advice to choose the good part. Never forget. Jesus does care. And by choosing that which is better. It can never be taken away. Your posts always speak to my heart! Hmmm. I love this message. You described me perfectly.. Especially not my Air Traffic Control husband. I will start on my way to achieving this very thing today. My live would be a lot calmer and focused.